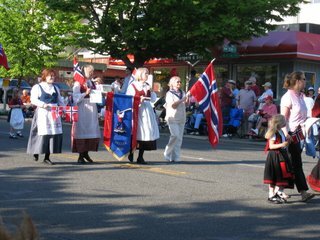 Spent more than an hour this evening at the Norwegian Independence Day Parade on 24th Ave. NW in Ballard. It's a big, colorful event that benefits from Scandinavian enthusiasm and organization. Marchers assembled on 62nd Ave. NW and headed south on 24th at precisely 6 p.m. There were marching bands, including the outstanding Ballard High School band, a band from Vancouver, Wa., with a terrific rhythm section, and the band from Olympic View Middle School, which must be the largest marching band in the planet (and certainly the one with the most wind instruments). Floats included two fire-breathing (well, smoke-breathing) dragons, several beauty queens and princesses, and a hydroplane (hey, this is Seattle). The drill teams were rather hideous (now we know where the army finds female drill sergeants) with the exception of the one from the Ballard branch of the Seattle Library, which did a precision formation with red library carts to wild applause. Groups represented in the parade included two or three of the local Scandinavian retirement homes; the Foss Home and Village had borrowed the Duckmobile! Here are a few more photos of the marchers. The spectators were just as interesting as the parade, but I didn't think I should take pictures. I saw a massive, red-nosed Viking-lookalike with long gray hair watching the parade from the doorway of a dark sports bar. The parking strips were filled with families who had brought folding beach chairs and complete picnic meals. The balconies of the apartment buildings along the route were packed with elderly Ballardites obviously attending their annual parade-watching parties. Up by the parade assembly area, virtually every driveway and yard had a barbecue grill going and a picnic table filled with goodies. On my walk back home people kept offering me food. 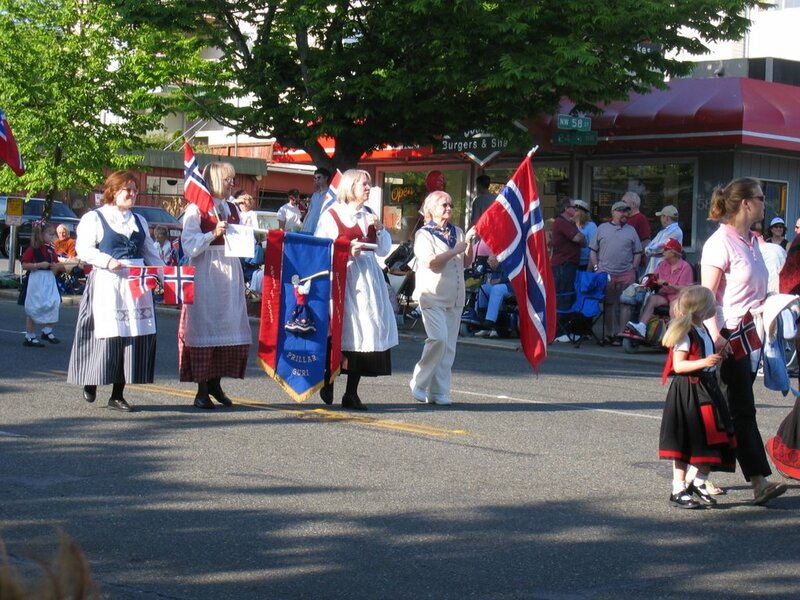 I ended up carrying some flags for an elderly woman in Norwegian costume so she could use both hands to eat a barbecued chicken drumstick on her way to her car. Ballard really knows how to party.